In 1985, desiring a meaningful, high-paced career in public service, Rachel Wentz left her university studies to become a firefighter/paramedic. Only the eighth woman hired by the Orlando Fire Department, a highly competitive department steeped in tradition, Wentz excelled, completing an AS in Fire Science, a master’s in public administration, and numerous specialized training courses to prepare her for an administrative position within the department. Wentz spent eleven years with OFD, experiencing a career that was every bit as exciting and challenging as she had sought. 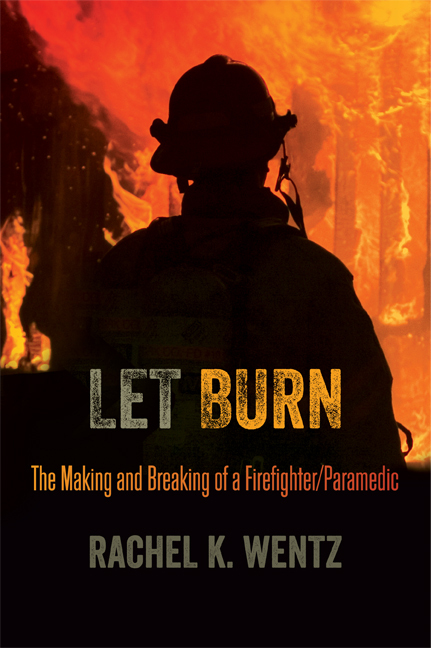 A moving, candid, and eloquent memoir, Let Burn recounts her experiences as a firefighter/paramedic, during which time she witnessed aspects of life and death few people are privy to, experiences that shaped her as a professional and as a person. From the rigorous demands of training to the extraordinary calls Wentz responded to, Let Burn details the gratifying aspects of the field, but also demonstrates the precarious nature of the job: a heated altercation at the scene of an industrial fire leads to Wentz losing almost everything she’s worked for and the dramatic end of a storied career. In vivid detail, Let Burn provides a firsthand glimpse into the hidden world of firefighting and emergency medicine. Rachel K. Wentz retired from OFD in 2001 after eleven years of service and went on to complete a master’s and PhD in Anthropology from Florida State University. She is currently an archaeologist who specializes in the analysis of human remains and is Regional Director for the Florida Public Archaeology Network. The Florida Authors & Publishers Association (FAPA) gave out its prestigious annual President’s Awards for the best books of 2013-2014 by authors and publishers in Florida and throughout the United States. The event recognized outstanding books by awarding gold and up to two silver medals in categories ranging from children’s books to adult fiction, from memoirs to self-help, from business books to e-books. “The award winners represent some of the very best books published in by national and Florida writers and presses in the past year and a half,” said FAPA President Chris Angermann. The winners were selected by 35 judges–32 national state librarians and three graphic designers.